Mrs. B, a Christian, who will be celebrating Easter tomorrow, and I, a Jew, celebrating Passover this week, are really in for a special treat tonight at Jones Hall with another great program from our great Houston Symphony Orchestra. This will be special for three reasons: the conductor, the soloist, and the concert program. 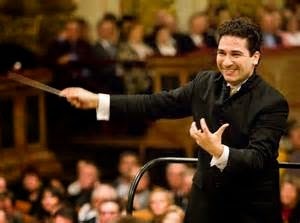 The conductor for tonight, as we wind down the 2013/2014 HSO concert season, will be our [Houston Symphony Orchestra] director designate, Andres Orosco-Estrada, who officially takes over as the director of the HSO this September at the start of the 2014/2015 concert season. We have been lucky to already have seen a preview of our new Maestro a couple of times this season and wow, is this man something special. Not to take away from any of the awesome directors the Houston Symphony Orchestra has been blessed to have in their history, but in my opinion, the young, exciting Andres Orosco-Estrada ranks right up there with the best [if not the best]. 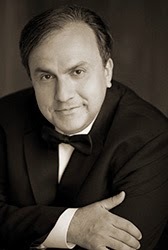 The soloist in tonight's concert will be Russian born, Israeli-American virtuoso extraordinaire pianist, Yefim Bronfman. He will be performing the second piece in tonight's program, Beethoven's piano concerto #4. From the HSO website they describe Mr. Bronfman: "The Los Angeles Times speaks of Grammy® winner pianist Yefim Bronfman’s “technical prowess and unforced showmanship.” The virtuoso returns to Houston to lend both depth and brilliance to Beethoven’s Piano Concerto No. 4." The video in this post will demonstrate Bronfman's brilliance at the keyboard. The third reason I mentioned that makes this night special is the program. Not only do we get to hear a great Beethoven piano concerto [his 4th], but before that to open the concert will be Smetana's "Overture to the Bartered Bride" and after intermission the concert concludes with a wonderful piece by one of my favorite composers, Antonin Dvorak, his symphony #8. Here is how it is described on the Houston Symphony Orchestra's website: "Conductor Andrés Orozco-Estrada then brings out the droll woodwind melodies and exuberantly carefree waltzes of Dvorák’s Symphony No. 8." Here is the pianist Mrs. B and I will see tonight, Yefim Bronfman, in a video taken from the Houston Symphony Orchestra's web site, of the soloist playing Rachmaninoff's Piano Concerto #3. While we will be seeing Mr. Bronfman performing Beethoven's great piano concerto #4, the Rach 3 in this video magnifies the soloist's brilliant virtuosity. This concerto, that may be unmatched for difficulty, has three movements: 1. Allegro Ma Non Tanto; 2. Adagio [which begins at 26:02 in this video]; then, after a bridge between movements 2 and 3 [with an explosive phrase just before movement 3] is the exciting final movement 3. Alla Breve [that begins at 26:05]. While there are not many, if any, piano concertos that can match Rachmaninoff's second piano concerto for beautiful melodies, there are also not many concertos that can match Rachmaninoff's third piano concerto for drama and excitment. Please turn up the volume and enjoy the virtuosity from the soloist Mrs. B and I will enjoy tonight.